I am not the boldest person in the world. A lot of times I just pretend to be, and other times I have a little help. The other day, #3 son accompanied me to the Sandhills to do a little work on the cabin. 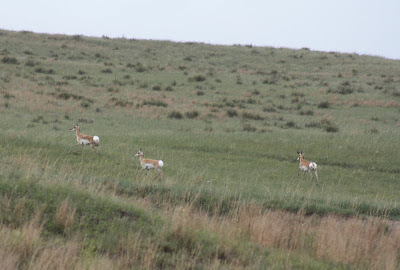 On the way home, we saw the same three antelope I see regularly on the drive. If I had been alone, that would have been the end of the story. If I got a picture at all, it would have been of their white furry rumps skeedadling over the hill. 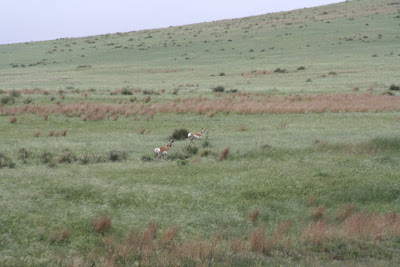 But, at the urging of the boy, I hopped out of the Pilot, climbed the fence and started stalking antelope. 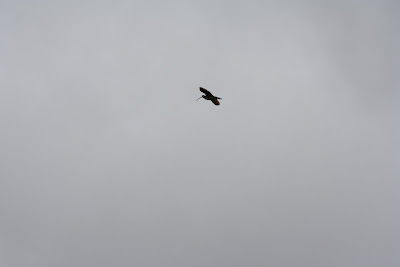 It's hard to sneak up on any wily critter when a Curlew is broadcasting your every move. I've always found it to be a good practice that when hiking in the Sandhills, it's best to keep your eyes on your feet, just in case. However, when you're trying to sneak up on something, that's really hard to do. That's why when a toad about the size of a dinner plate hopped across my foot, I about... well, I about jumped out of my skin. Cross a small rise, run down a gully, top another hill... and here they are, still running away! Down another small valley and, success! Caught them stopped and looking at me. 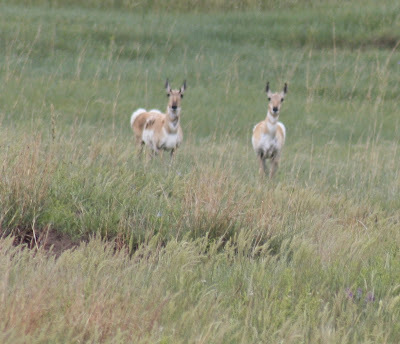 The boy swears that he saw a little bouncing bundle of baby antelope when we first caught sight of them, but by this time the cautious mamas had him stashed safely in the grass. It wasn't long before they decided they had better things to do than stand around and watch this crazy woman come closer and closer to them. 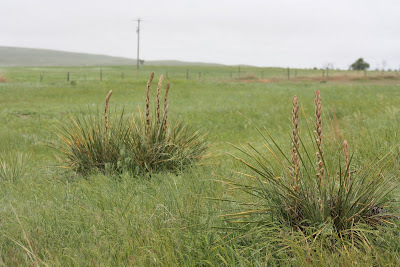 Another shot of my favorite native Sandhill plants, getting ever closer to full bloom. 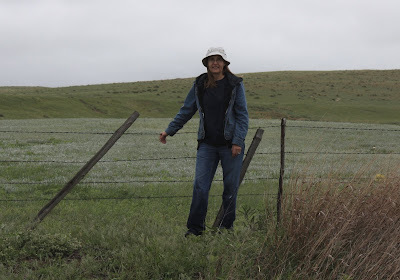 And here I am, after a three-quarters of a mile or so trekking over the Sandhills on my quest, wet to the knees and very winded, but happy that I was bold, for once!